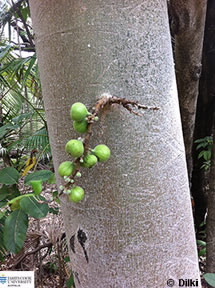 This fig is easily recognised by the large clusters of figs that are borne on short branches off the trunk, it is cauliflorous. These figs change from green to red as they mature. The stem appears rough because of the remains of these old inflorescences.